I offer this article for my readers hoping to encourage a comparison between the 1347 Battle of Crecy (Article posted earlier today) and the 1863 Battle of Chickamauga (Article referenced below). There is great risk in the initial employment of technology, for military, business, or educational purposes. Those daring to try (King Edward III, President Abraham Lincoln) will suffer or prosper as circumstances dictate. Currently, our school, Stuyvesant High School, has resisted the trend to integrate technology despite the increasing momentum to do so. The school, like many individuals, has become ‘comfortable’ and complacent in this realm. While other institutions have taken a ‘risk’, our school wishes to avoid ‘rocking the boat’. As with King Edward and President Lincoln, the decisions of leaders in this arena may well decide the outcome of current and future struggles. Lincoln’s natural interest in things mechanical would come to be tested — and celebrated — in the Civil War. The North’s huge advantage in men and technology was only as good as the tools of war that Lincoln’s Bureau of Ordnance was able to place into those men’s hands. Among other martial innovations, the ironclad the Monitor may never have left John Ericsson’s drawing board had Lincoln not personally approved and recommended the design. The president took a particular interest in rifles and ammunition as well. Infantry warfare was quickly making the transition from the smoothbore muskets that won the Revolutionary War to “rifled” weapons that were more accurate, with greater range and firepower. While the smoothbores could still be effective in close quarters, inventors and arms manufacturers sought ways to increase the distance — and speed — with which soldiers effectively could fight. One such inventor was young Christopher Spencer of Connecticut. Spencer learned the machinist’s trade as a 14-year-old apprentice at a silk manufacturing company, and later worked at the Samuel Colt factory in Hartford, where he learned arms making. The Colt factory was famous for pistols and other side arms, but Spencer became convinced of the feasibility of designing a breech-loaded repeating rifle that could be reloaded easily and rapidly. United States Patent Office Illustration to accompany the patent application for the Spencer repeating rifle. At the time, a single-shot, muzzle-loaded gun could be fired perhaps three times a minute by an experienced rifleman. Spencer conceived of loading the weapon instead through the breech (thus eliminating the need for ramming the round down the barrel), and created a magazine capable of storing seven shells, which could be sequentially spring loaded and fired by simply cocking and replacing the trigger-guard lever. The “Spencer Repeating Rifle” was capable of firing 15 to 20 rounds a minute. 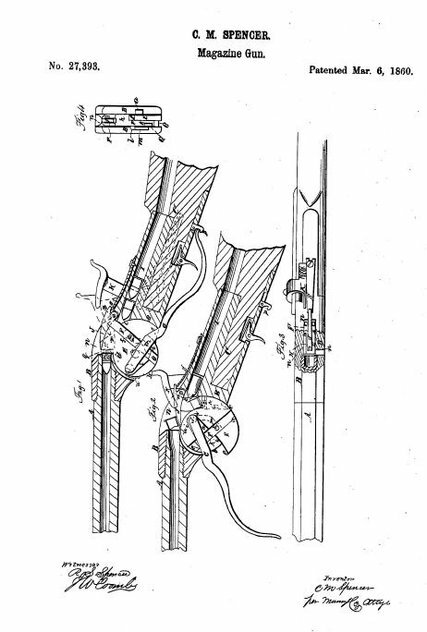 Though his was not the first breech-loaded weapon, his improvements to the existing art justified a government patent, which he received in 1860. Spencer’s first government order, in mid-1861, was 700 rifles to the Union Navy. His financial partner Charles Cheney was able to secure for Spencer an audience with the Navy’s director of ordnance, John Dahlgren, in June 1861, through the assistance of Cheney’s friend Gideon Welles, the secretary of the Navy. During two days of rigorous testing (including burying the rifle in sand, and immersing it overnight in salt water), the Spencer rifle fired successfully over 250 times, reportedly with only one misfire. Spencer’s company had early production and financing problems — he was, after all, an inventor and not a businessman — and was unable to meet even the modest Navy Department order in timely fashion. But the real roadblock to wider military acceptance and development of the Spencer was the Department of War Chief of Ordnance, Gen. James Ripley, who dismissed the Spencer and similar breechloaders as just “newfangled gimcracks,” and he refused to authorize their purchase. After two years of personally demonstrating the Spencer to Army and Navy commanders in the field, including Gen. Ulysses S. Grant (who reportedly pronounced it “the best breechloading arms available”), Spencer finally decided to take his case to the top. Again with Cheney’s aid, Spencer was able to secure a meeting with Lincoln. on August 17, 1863, I arrived at the White House with the rifle in hand, and was immediately ushered into the executive room, where I found the President alone. After a brief introduction, I took the rifle from its cloth case and handed it to him. Examining it carefully, and handling it as one familiar with firearms, Mr. Lincoln requested me to take it apart ‘and show the inwardness of the thing.’ The separate parts were soon laid on the table before him. It was the simplicity of the gun which appealed to President Lincoln, and he was greatly impressed with the fact that all that was needed to take it apart was a screw driver. With this implement he bared the vitals of the gun and replaced them so that the gun was ready to shoot in a few minutes. Impressed with its design, the president invited Spencer to meet him the next day for a trial of the weapon. True to form, Lincoln prepared to personally test the Spencer. At the appointed time on Aug. 18, Spencer arrived at the White House and accompanied the president, his son Robert and an official from the Navy Department, who carried the rifle, target and ammunition, for a short walk to the Mall, near the site of the unfinished Washington Monument. Lincoln stopped by the War Department on the way and his son Robert invited War Secretary Edwin M. Stanton to accompany the party for the test, but the secretary declined due to the press of business. “They do pretty much as they have a mind to over there,” mused the president philosophically. So, minus the hard-working secretary of war, the president’s party proceeded to the Mall to try out the Spencer Repeater. At the conclusion of the day’s shooting, Spencer was presented with the half of the target used by the president as a souvenir of his visit, which many years later he donated to the Lincoln museum in Springfield, Ill. The president meanwhile must have enjoyed the outing, and the uncommonly pleasant August weather, as he went out again the next day with his “Spencer” for another hour’s shooting with Hay. For young Christopher Spencer and his fledgling company, the time spent at target practice with the president was well worth it. Less than a month after their meeting, the incorrigible and aging General Ripley was forcibly retired from active duty by Secretary Stanton, and assigned to be inspector of forts in New England. The Bureau of Ordnance soon after placed additional orders for the Spencer Repeaters, and by the end of the War, some 85,000 of them (both rifles and carbines) had been put in service. And only a month after Spencer’s outing with Lincoln, the Spencers proved their mettle. At the Battle of Chickamauga, a Union brigade under Col. John Wilder, all equipped with Spencers, held off and virtually destroyed a much larger Confederate regiment of Gen. John Bell Hood as it breached the Union lines and threatened to collapse the entire northern flank of the Union line’s southern branch. The Spencer Repeater had only one stain on its record. In April 1865, less than two weeks after Lincoln’s assassination, Union soldiers searched for and surrounded a fugitive from justice in the Virginia countryside. As he lay dying in a barn on Garrett’s Farm, John Wilkes Booth was found armed with a large bowie knife, two pistols – and a Spencer carbine.